First, they voted with their applause. Then, they voted at the ballot box. Finally, after every one of the audience members made their personal choice from thirteen world-class finalists, they voted James Cielen Grand Prize winner of the People's Choice Award. 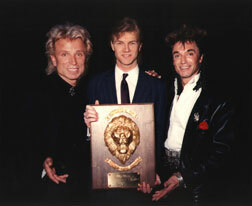 The Siegfried and Roy Golden Lion Award for the People's Choice is one of the most prestigious awards in the world of magic. To be judged worthy of this honour, James Cielen competed against top magicians from Japan, Europe, South America, and the United States. His stellar performance in front of a sold-out audience of lay people and fellow magicians at the Tropicana Hotel in Las Vegas once again establishes him as both an accomplished magician and a premier entertainer. James Cielen. Award winning magician.